Still having problems choosing out the perfect dock for your beloved iPod? Here, allow me to throw another speaker dock into the ring that will tantalize the hoo-hahs of minimalists out there. 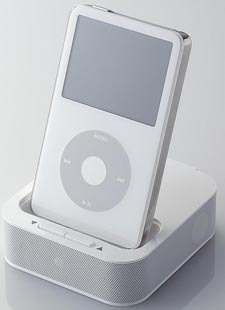 The ASP-P100 is a very small iPod dock that is available in black and white and it includes two, 1W speakers to pump out those phat beats. It has an included USB connection for syncing, but it can also operate on four AAA batteries. Portability ftw.